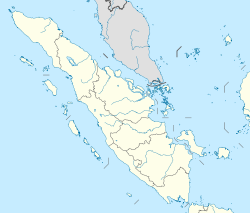 Batam is the largest city in the province of Riau Islands, Indonesia. The city administrative area covers three main islands of Batam, Rempang, and Galang (collectively called Barelang), as well as several small islands. Batam Island is the core urban and industrial zone, while both Rempang Island and Galang Island maintain their rural character and are connected to Batam Island by short bridges. Batam is an industrial boomtown, an emerging transport hub, and part of a free trade zone in the Indonesia–Malaysia–Singapore Growth Triangle, located 20 km (12 mi) off Singapore's south coast and also part of the Indonesia–Malaysia–Thailand Growth Triangle. According to Statistics Indonesia's 2016 estimate, Batam has a population of 1,236,399, making it the third largest city in the region of Sumatra, after Medan and Palembang. It is the closest part of Indonesia to Singapore, at a minimum land distance of 5.8 km. During the 2010 national census, Batam was the fastest-growing municipality in Indonesia the decade prior, with a population growth rate of 11% per year. In 2017, the island suffered severe job losses, some 300,000 workers were laid off. Batam Island was first inhabited by the Malays as the Orang laut in the year 231 AD. The island that once served as the field of struggle of Admiral Hang Nadim against the invaders was used by the government in the 1960s as a petroleum logistics base on Sambu Island. In the 1970s, according to Presidential Decree number 41 year 1973, Batam Island is designated as a working environment of an industrial area supported by Batam Island Industrial Development Authority or better known as Batam Authority Board (BOB, now Batam Development Board (Indonesian: Badan Pengusahan Batam or BP Batam) as the driving force for the development of Batam, with the initial aim of making Batam the "Indonesian version of Singapore". With the rapid development of the island, based on Government Regulation No. 34 of 1983, the Batam District (which is part of Riau Islands Regency) was upgraded to municipality status which has the duties in running government administration and society and support the development of BP Batam. In the Reformation era in the late 1990s, with Law No. 53 of 1999, Batam administrative municipality changed its status to an autonomous region, namely Batam City Government to carry out governmental and developmental functions by involving BP Batam. Batam is a roughly oval island with many bays, islets, and peninsulas, located west of Bintan Island, south of Singapore, north of Rempang and Galang, and east of Bulan Island. The Riau Strait separates Batam and Bintan. 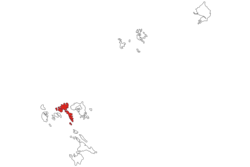 Batam Municipality covers 3,990 km², of which 1,040km² is land, a figure which includes some land reclamation. However, Barelang Island (not actually one but three, see above) covers roughly 715 km² of that 1,040 km², and Batam island itself covers only about 410 km² out of the total. The bulk of the municipal population resides on Batam island. Batam has a tropical climate with average temperatures between 26 and 32 °C. Humidity on the island ranges from 73% to 96%. The wet season spans from November to April, while the dry season is from May to October. Average annual rainfall is around 2,600 mm. The role of Batam City government takes care of all population administration and civil registration as well as Human Resources. In realizing the democratization and continuity of governance in Batam City, on January 5, 2011, the election of the mayor and the deputy mayor of Batam was. Ahmad Dahlan and Muhammad Rudi were elected Mayor and Deputy Mayor of Batam period of 2011-2016. The current mayor is Muhammad Rudi for the period 2016-2021, accompanied by Amsakar Ahmad as Deputy Mayor of Batam. Agency for Free Trade Zone and Free Port of Batam, often abbreviated as BP Batam, is a government body under the Chairmanship of the Board of Regions (DK) Batam Central Government, which is chaired by Darmin Nasution, Coordinating Minister for Economic Affairs. BP Batam plays a role in land governance and investment in the Special Economic Zone (SEZ) of Batam. In April 2012, Batam had a population of 1,153,860 inhabitants. The population is increasing rapidly, with a population growth rate of more than 8% per year between 2001 and 2012. Today, Batam is inhabited by a heterogeneous mixture of people due to labor migration and desire to be close to Singapore; it is very diverse, some 2/3 of the total are migrants. The predominant ethnicities are Javanese, Malays, Batak, Minangkabau, and Chinese. As a municipality it exemplifies the national motto of "Bhinneka Tunggal Ika" (Unity in Diversity). The location of Batam close to Singapore is conducive to the development of economic, sociopolitical, and cultural aspects of the local community. Islam is the majority religion in Batam, followed by Christians, Buddhists and Hindus. Most of those who follow Islam are Javanese, Malays and Minangkabaus. The Great Mosque of Batam, located in the city center adjacent to the main square, the mayor's office and the provincial Parliament, is an important symbol of Islamic religious life in Batam. Christianity are also widely embraced by people of Batam, especially those from the Batak people of Sumatra and migrants from Flores also from East Indonesia. The majority of the Chinese population practises Buddhism. A number of Viharas are located in Batam, of which Vihara Duta Maitreya is one of the most frequented, and is the largest Vihara in Southeast Asia with an area of 4.5 hectares. Indonesian is the common lingua franca of Batam in daily use. Malay, Minangkabau, Batak, Javanese, and Chinese ethnic dialects like Hokkien and Teochew are also used. The usage of Mandarin and English are trending due to Singaporean influence, especially by expatriatess living in Batam. Based on Presidential Decree No. 41/1973, the Batam Industrial Development Authority (BP Batam) was established to manage 415 square kilometer industrial complex in Batam City for heavy industry. Previously only Pertamina, the Indonesian state oil company, settled there with only 6,000 inhabitants. Shipbuilding and electronics manufacturing are important industries on the island. Being located close to the ports of Singapore, the speed of goods shipping and product distribution is increased, benefiting the island's economy. With lower labor costs and special government incentives, it is the site of many factories operated by foreign companies. Under a framework signed in June 2006, Batam, along with parts of neighbouring Bintan and Karimun, are a part of a Special Economic Zone with Singapore; this zone eliminates tariffs and value-added taxes for goods shipped between Batam and Singapore. In 2007, Law No. 44 was enacted to supplement Law No. 36/2000 in establishing Batam as a free trade zone for 70 years. BP Batam still manage the industrial complex. And in 2016, responsibility of industrial complex changed from Governor of Riau Islands Province to the Office of the Coordinating Economic Minister as per Presidential Decree No. 8/2016. Over 1.5 million tourists visited the city in 2015. Batam is the third-busiest entry port to Indonesia next to Bali and Jakarta. In 2014, around 58.8% of foreign tourists came from Singapore, 12.8% from Malaysia and 4.2% from South Korea. Ferries connect Batam to Singapore, Bintan, and Johor Bahru (Malaysia). Five ferry terminals are on the island: Harbour Bay International Ferry Terminal, Nongsapura Ferry Terminal, Sekupang, Waterfront City, and Batam Centre International Ferry Terminal. Connections to Singapore are by way of Harbourfront and Tanah Merah Ferry Terminals run by Singapore Cruise Centre (SCC). The most recent incident happened on 29 November 2015 when a ferry, 'Sea Prince', hit floating object(s) while en route to Singapore from Batam and began leaking. A total of 97 passengers were rescued on life rafts. Signs showing a picture of a raised finger over a pair of lips have been placed in August 2014 at the Batam Centre International Ferry Terminal to request silence while queuing for immigration to hear names being called and clearly hear instructions given by the immigration officer. Some visitors have been sent back immediately on the first ferry available for flouting this rule. The signs are also applicable at other terminals, but they are not strictly enforced. Trans Batam is the most reliable and the cheapest public transportation in Batam. It began to operate in 2005. Trans Batam is the second BRT system in Indonesia, after Jakarta's TransJakarta. The price for one ride is Rp2,000 for students and Rp4,000 for the public. Trans Batam operates from 05:30 to 19:00. Taxis in Batam are available almost anywhere, at ferry terminals, the airport, shopping malls, hotels, etc. More than 3000 taxis are in Batam. In the early 2000s, Batam commonly had Toyota Corolla taxis. Starting in late 2013, more than 95% of taxis are brand new using the Toyota Limo and Chevrolet Lova. Hang Nadim International Airport is the island's main airport, and has the longest runway of all airports in Indonesia. The airport was the largest airport in the Sumatra region from 1995–2012 with a capacity of six million passengers annually, and is now the second-largest in the Sumatra region after Kuala Namu International Airport in Medan with a capacity of eight million passengers. The airport has 4 pair of jetbridges and 2 single jetbridges. Hang Nadim International Airport is the hub for Lion Air, Batik Air, Citilink, and Malindo Air. BP Batam, which operates Hang Nadim International Airport, will build a new terminal with a capacity of eight million passengers per year for each terminal (16 million passengers per year in total for two terminals) in late 2016. BP Batam intends to build eight pair of jetbridges in the new terminal. Domestic destinations include Pekanbaru, Palembang, Medan, Jakarta, Padang, Surabaya, Bandung, Bandar Lampung, Balikpapan, Yogyakarta, Makassar, and many more. International flights currently include Kuala Lumpur, Malaysia (operated by Malindo Air). Due to piling works for touristic activity, sand mining, and logging for charcoal business, only 4.2% of Batam island is covered in mangrove forest, a great decrease from 24% in 1970. Originally, Batam Island had 41,500 hectares of mangrove forests. ^ "Indonesia-Malaysia-Thailand Growth Triangle (IMT-GT)". imtgt.org. ^ "Country Information – Indonesia-Malaysia-Thailand Growth Triangle (IMT-GT)". imtgt.org. ^ Firman, Tommy (12 May 2012). "Urbanization and urban development patterns". The Jarkata Post. Retrieved 11 August 2016. ^ Post, The Jakarta. "Batam economy in a state of emergency, mayor says". thejakartapost.com. ^ "Pulau Batam Dihuni Orang Selat Sejak 231 Masehi". Tribun Batam (in Indonesian). 18 December 2012. Retrieved 18 December 2018. ^ a b Hutchinson, Francis E.; Chong, Terence (14 June 2016). "The SIJORI Cross-Border Region: Transnational Politics, Economics, and Culture". ISEAS-Yusof Ishak Institute – via Google Books. ^ "Indonesia: Administrative Division (Provinces, Regencies and Cities) - Population Statistics, Charts and Map". www.citypopulation.de. ^ a b "BP Batam: 45 years of developing Batam". 3 December 2016. ^ "Indonesia President inaugurates Batam free trade zone". Xinhua General News Service. 19 January 2009. ^ Teo, Laurel (19 May 2007). "Indon SEZ rules ready by end-May; Setting of a deadline likely to please potential investors". The Business Times Singapore. ^ "Batam Island - Where Business Meets Pleasure – Indonesia.Travel". indonesia.travel. ^ "Singapura & Malaysia Penyumbang Wisman Terbanyak ke Batam". batampos.co.id. ^ "Bulan Desember Tahun 2014, Jumlah Wisatawan Mancanegara yang Berkunjung ke Kota Batam Mencapai 171.907 Orang". bps.go.id. ^ Meah, Natasha; Yin, Chai Hung (1 December 2015). "Batam ferry incident: 'People fended for themselves'". The New Paper. AsiaOne. Retrieved 11 March 2016. ^ "Batam ferry incident: Passenger claims overcrowded rafts burst during evacuation". AsiaOne. 30 November 2015. Retrieved 11 March 2016. ^ "Shhh! Be silent at Batam immigration queue or be sent back home". 17 August 2014. ^ Chris Kitching (19 August 2014). "'Keep quiet or you'll be kicked out of the country! ': Ferry terminal's noisy visitors could be DEPORTED if they even whisper while standing in immigration queues". ^ "Batam Loses 800 Hectares of Its Mangrove Forest". 15 June 2015. ^ "Batam Mangrove Forest Shrinking in Size". 7 October 2015.